Did this in Geology class one day. 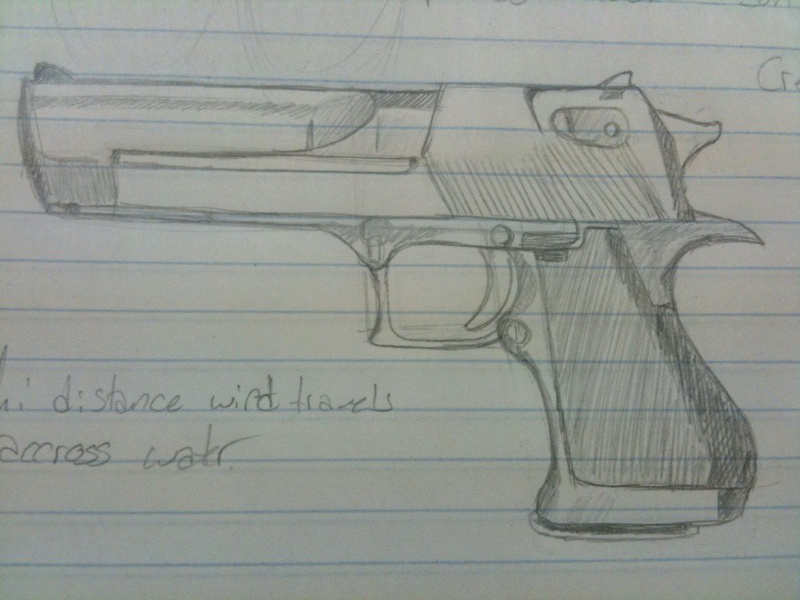 Wanted to see if I could draw a good enough gun for my BF to guess what it was without the name engraved on it. He did! Very impressive artwork! The instant I saw it, I thought, 'definetly a Desert Eagle. No doubt.' Barrel's a tad short, as ExhumedLegume said, but then again said handgun COULD be customized as such. VERY nice! Well, for a bit more practice, try a shotgun of some variety, or maybe an assault rifle. My personal suggestion? AK-47. A true classic. AK sounds fun. XD Next time I'm bored in class I may doodle one up.